It only took me about a minute to scramble up the 20-foot wall, but by the top, my muscles, mind, and nerves were all quivering — my muscles because climbing straight up with arms and legs on tiny pegs gets your blood immediately surging; my mind because constantly choosing your route makes for a great brainteaser; and my nerves because the only thing saving me from a fall was our newspaper’s tardy arts editor, whose late arrival meant that he was getting a quick lesson on how to lower me properly, right as my grip began to slip. This was my introduction to Santa Barbara Rock Gym, the brand-new facility near where State Street dips under the freeway, and while I was in all reality perfectly safe, the blend of sweat, smarts, and scare proved an addictive thrill. 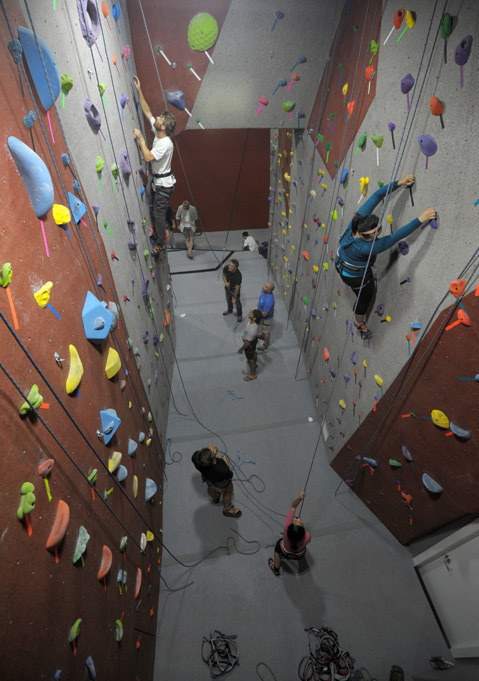 That’s because the 8,500-square-foot gym — which features an endless variety of simple to Sisyphean climbing routes, an extensive bouldering wall, and a growing list of classes and programs for all ages and skill levels — filled a massive void in Santa Barbara, which is one of the climbing capitals of the world but has never had an indoor place to practice. But attracting the experienced “dirtbags” is only a small part of what Russ hopes to accomplish. “A big part of our focus is families, birthday parties, stuff like that,” he explained, adding corporate team building and special events to the list, including an in-the-works Halloween party that will feature $2,000 in costumed climbing-for-cash prizes. 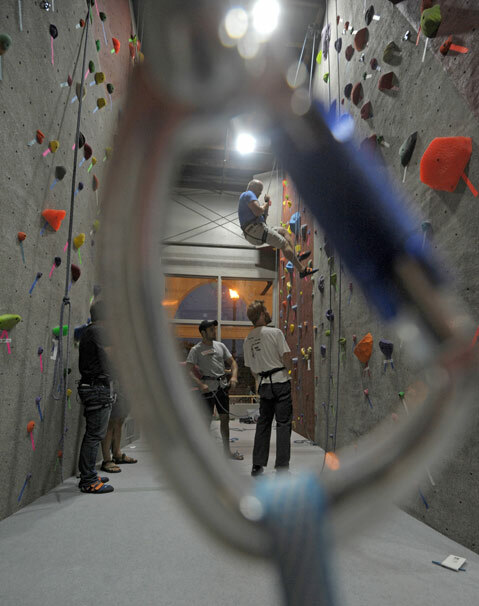 The accessible-to-all attitude certainly rang true on the night our staff visited: The intro lesson delivered by instructors Dean and Chris was entertaining and easy to follow, and even the 11-year-old son of one of our copy editors confidently conquered the wall. That S.B. Rock Gym is located next door to the new REI outdoor superstore doesn’t hurt, but Russ can’t claim much responsibility for that connection. “It was dumb luck more or less,” said Russ, who only found out about REI after scouting the location. What’s not dumb is his attention to spreading the love around: Instead of selling loads of climbing gear or offering tours to outdoor spots, the gym is referring its customers to other stores and outfitters, often with discounts for members, and exploring relationships with other gyms in hopes of offering full fitness packages. Best of all for climbing neophytes like me, the gym is making it really easy for those who just want to get a taste of the action, with a two-for-one couples night on Tuesday, half-price college night on Wednesday, and $5 Friday, when that’s all it costs to climb from 5-10 p.m. (save for rental gear, if you need it). But beware — if you like a sport that challenges your body and mind while exhilarating your soul, that first hit might get you hooked. 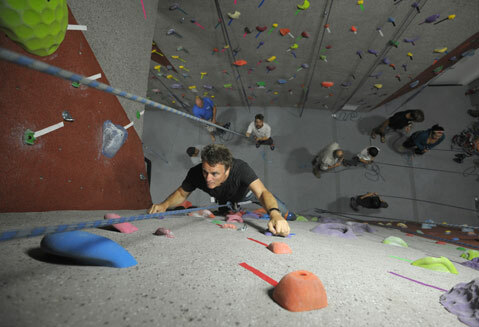 The Santa Barbara Rock Gym is located at 322 State Street; parking is in the REI lot at the end of Anacapa Street. See sbrockgym.com or call (805) 770-3225.